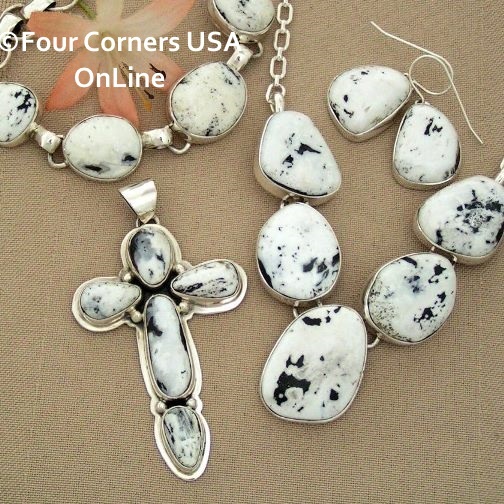 Four Corners USA OnLine offers an extensive Collection of White Buffalo Stone Turquoise Jewelry by renowned Native American Artisans to compliment any Style or Budget. 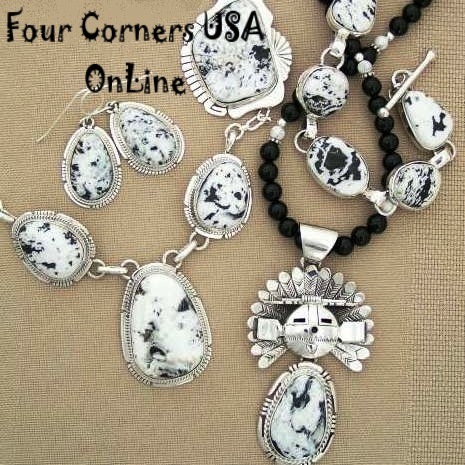 Although our selections of these fine handmade one of a kind jewelry pieces are always evolving you will often find some of our favorite Native American Silver Turquoise Jewelers such as Phillip Sanchez, John Nelson, Freddy Charley, Tony Garcia and Lyle Piaso designing for these quality White Buffalo Turquoise stones with signature Black White coloring. Choose from Pendants, Necklaces, Jewelry Sets, Earrings, Rings, Link and Cuff Bracelets. Moveable SunFace Kachina Sacred White Buffalo Turquoise two piece Wearable Art Pendant by Native American Navajo Silversmith Freddy Charley with complimentary Bead Necklace. Gorgeous and very detailed Tawa or Sun Kachina Sterling Pendant. Kachina is the primary religious belief system practiced by American Pueblo Indians prior to the Spaniard influence. Kachina Dolls are given to children as part of Pueblo Spiritual Teachings. From the Mine to the Stone Cutters to the Silversmiths, it has been a long journey and we are proud to present this beautiful assortment of White Buffalo Turquoise Jewelry.